Citadel is a young and ambitious new band from Finland. The members of the band range in age from 18-23. However, these young musicians seemed destined for a bright future given the quality of this 4 track EP entitled Vortex that is now playing in my stereo. They are playing melodic speed / power metal, and they play it like seasoned veterans of the genre. The band cites its biggest influences as Stratovarius and King Diamond. The King Diamond influence relates to his ability to combine storytelling and melodies into his own style of heavy metal. Petteri Urmas also uses music to express his own real life story of despair, frustration, heartache, and the deep longing for the mystical "vortex" that will allow our souls to pass on to better worlds and dimensions. The final track concludes with the spoken narration, "The end is always a beginning." And thus the story has concluded. Petteri is able to put his story to music without lecturing, but instead he gives the listener the opportunity to journey into his world and derive his own interpretation of what has been told. I certainly appreciate this thought provoking style of songwriting, and I am confident that other will enjoy it as well. The music itself is melodic power / speed metal that retains a unique sound, while taking a bow to the acknowledged main influence, Stratovarius. However, the lead vocalist reminds me of a young Hansi Kürsch. His voice is able to to color the songs with much emotion. Also, his vocal delivery is not confined to the high registers, which I feel makes a lot of bands in this genre sound all too similar. 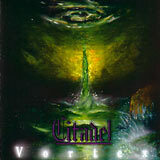 Citadel seems to have no problem whatsoever creating songs with blistering speed and instantly recognizable melodies. The keyboards are not overwhelming, yet they add just the right atmosphere much in the same way that worked so well for the Ecliptica album of Sonata Arctica. I can certainly hear some Stratovarius style riffing in the music, which is executed without flaw. Considering the age of these four musicians, I'd say the musicianship is well beyond what I expected prior to my first spin of the CD. The thoughtful and mature songwriting combined with the enjoyable music demands repeated listens. These four songs show incredible potential for the four young musicians. In the promo package, the band states that they have many stories left to tell, and hope to find a record company in order to help them continue. Vortex is already a very commendable effort for this band and they have so much time still to grow and take their music to even high levels.. I can only imagine that a wise record company will recognize this and give them the opportunity they truly deserve.